Vessel Vape Pen, review by Canniseur team, Steve and Annie. This vape pen has captured our attention. If you’re looking for the perfect gift, this vape pen will be cherished by your favorite cannabis consumer. Designed to be sleek, stylish, and elegant, the Vessel pen speaks quality. It’s a vape pen that you’ll be proud of when you pull it out of your pocket or purse. It speaks ‘class’. It’s the perfect gift for your best weed smoking friend. 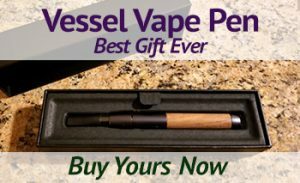 The Vessel vape pen makes a great birthday or holiday gift for those with discerning taste. We have two of the styles and both pens operated identically. They both had a great weight balance. Handling of either Vessel pens compares to holding a well-balanced tool. The weight of a well-crafted tool feels perfect. The two handsome pens looked very different from each other. The second style we tested was the Wood Core – Slate/Walnut version. It had a beautiful piece of real walnut for the barrel which gave it an extra flare. 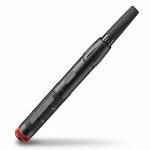 This is a vape pen one might use in a c-suite or boardroom. The Wood Core pen barrel feels great to the touch and has the same weight and heft of the Expedition. They both feel incredibly natural in your hand. Both are a pleasure to look at. Very nicely designed indeed. Vessel has 4 other styles and they looked equally as sophisticated. How Well Does the Vessel Vape Pen Work? The draw is what really separates the Vessel vape pens from others in the marketplace. Simply put, it’s fantastic. Smooth, powerful, and clean, you get a lot of vapor, with a very easy inhalation. We’re used to having to really pull in the vapor, but not with Vessel pens. And the vapor is…well, it’s just velvety smooth. This pen had the best draw of any vape pen we’ve ever used, and we’ve (collectively) used a number of them. The Vessel, stands heads & shoulders above the other pens we’ve tried. While we don’t typically set products on a scale, the superior draw of the Vessel puts it at the top of any chart. The charging system turns everything on its head. 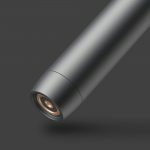 Instead of screwing in a small, fussy, and tiny nub on the pen, a magnetic attachment on the bottom of the pen takes care of your charging needs. What really rocks is that you don’t need to disassemble the vape pen to charge it up. How long does it take to charge? We don’t know as the Vessel Vape Pen comes ready to use and it has held the charge for the two weeks we’ve had them. So, safe to say the Vessel Vape Pen holds a charge very nicely. Screwing in the cartridge is a breeze and like most other pens. However, we really like that the cartridge is mostly hidden by the vape pen’s barrel. This creates the pen’s impressive looks. There’s just enough visual to guide you as to when you’re getting low on oil. We’re all about ease of use. The controls for both turning the Vessel on and setting the temperature are fussy. It takes 5 clicks to turn it on and 3 clicks to go through the temperatures. That’s a lot of motion and counting, and remembering… And trying to coordinate the clicks while you’re under the influence can be a bit of a challenge. Then again, if you’re unable to turn it on, perhaps you should put it down. One of us is sometimes slow on the take and has forever been partial to bongs. She likes the tactile and aromatic experience of a good bong. However, the discreet nature of vape pens is slowly winning her over. Being a bit less experienced with vape pens, she was not sure how to work the pen, and didn’t know how to check if it was pre-charged (comes at about 60%). Going to the vesselbrand.com website to look for a how to use video, turned up nothing. We would love to see a bit more instruction included in the box for the slower of us. :-) After a short while, she got the hang of it. Some vape pens have the click system, others don’t seem to. 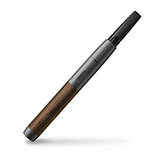 The PAX Era for cartridges and several others have iPhone/Android apps, and far easier access to set the temperature. We recommend The Vessel add more embedded software for it’s control system. Overall, this is a fine instrument. The draw is fine, smooth, and excellent. The aeration is superior. We heartily recommend purchasing this vape pen above all others. Some of the links in the above article may be ‘affiliate links’. This means if you click on the link and buy the product, Canniseur will make a commission. This is one way we earn our revenues. Read more about Canniseur here. Canniseur will only recommend products after we’ve tested them ourselves. Our reviews will always be honest and forthright. This disclosure is in accordance with FTC 16 CFR. This is beautiful! I’ll have to get one of these. Look at that wood!!!!! It’s a true beauty. I love the walnut look too. I’m waiting for mine for a week now! Can’t wait! I love mine. Let us know when you get yours and have tried it out! I like my wood model so well, I ordered another Vessel. This must be the most elegant, and smoothest functioning vape pen in the world. Highly recommend. I know, right? I absolutely love, love my walnut pen. Does this work with any cartridges? Hello- It works with any cartridge using 510 thread, which is fairly standard. Yep. Gotta keep track of the cord!